Cover of 1985 CD single for Sting’s ‘Russians’ song. Among musicians producing music aimed at the Cold War is British singer/songwriter Sting. In 1985 Sting thought this an important arena for song, and he produced one with a message and point of view — a song that became popular for time, especially in Europe. Formerly a member of the rock group Police, Sting had embarked on a new phase in his career. His debut solo album, The Dream of the Blue Turtles, released in June 1985, included a song entitled “Russians,” which was also released as a single in November that year. Ronald Reagan was President of the United States at the time, and Margaret Thatcher was Prime Minister of the U.K. In the Soviet Union, a succession of three leaders had occurred in the early- to mid-1980s: Yuri Andropov, Konstantin Chernenko, and Mikhail Gorbachev. The nuclear arsenals of the two “superpowers” — as the U.S. and the Soviet Union were then called — were still aimed at each other. Sting’s song was leveled at both sides, drawing on the Cold War’s nuclear rhetoric, which by the early- and mid-1980s was running quite hot between the U.S. and Russia, with Europe caught in the middle. Sting set his lyrics to the dirge-like Russian music of Sergei Prokofiev’s Lieutenant Kije Suite. His song covers some Cold War history, the bomb’s origins, and the tough talk that began in the 1950s. Sting first points to the famous November 1956 line by Soviet premier Nikita Khrushchev, who said, generally translated, “we will bury you” meaning the capitalist West. Khrushchev was addressing Western ambassadors at a Polish embassy reception in Moscow on November 18, 1956 when he made the remarks. Khrushchev on the cover of Time magazine early September 1961 when the Soviets resumed nuclear testing. “I once said, ‘We will bury you,’ and I got into trouble with it. Of course we will not bury you with a shovel. Your own working class will bury you.” Khrushchev was here referring to the Marxist proletariat as “the undertaker of capitalism” with communism the ultimate victor. In any case, “we will bury you” is what stuck and became a famous line from the mid-1950s on. Everyone knew the threat and implication. Republican U.S. Senator Barry Goldwater, when he ran for president in 1964, used a clip of Khrushchev making the remark during his presidential campaign. Khrushchev came off as a gruff and hostile leader in his speeches, prone to expressive outbursts. In an October 1960 speech at the United Nations (photo above), he reportedly pounded his shoe on the rostrum for effect. His unpredictable and blunt style, made him even more menacing in Western eyes. In any case, he was one of those Russian leaders who augured the Cold War ideology deeply into the world’s psyche in those years, which is why, no doubt, Sting chose to use him in the song. J. Robert Oppenheimer, Life magazine cover, October 10, 1949. Sting also touches on the origins of the bomb, with the line: “how can I save my little boy from Oppenheimer’s deadly toy.” Oppenheimer here is J. Robert Oppenheimer (1904- 1967), the American theoretical physicist and University of California, Berkeley physics professor who is known as “The Father of the Atomic Bomb.” He was the scientific director of the Manhattan Project: the World War II effort to develop the first nuclear weapons at the secret Los Alamos National Laboratory in New Mexico. Much has been written about Oppenheimer’s changing views on the value of nuclear weapons, first believing they would end all wars, then in later years trying to put the genie back in the bottle. Oppenheimer explaining the atomic bomb to U.S. military leaders, 1946. The bomb that Oppenheimer and his team developed was used on Japan during WWII, dropped on two cities in August 1945 — Hiroshima and Nagasaki — touching off for decades thereafter, an escalating nuclear arms contest between the U.S. and the Soviet Union. The understanding that followed with the nuclear arms build-up in both the U.S. and Soviet Union was that any nuclear exchange between the superpowers would result in all-out war and “Mutually Assured Destruction” (MAD). Ronald Reagan and his ‘Star Wars’ defense initiative on Time’s cover, April 4, 1983. Next came Ronald Reagan’s Strategic Defense Initiative (SDI), also known as “Star Wars,” a take-off on the popular 1977 film of that name by George Lucas. Reagan gave his “Star Wars” speech on March 23, 1983, proposing a space-based defense system equipped with high-powered lasers that would shoot down incoming Soviet missiles. Only a few weeks earlier, on March 8, 1983, Reagan had given his “Evil Empire” speech, in which he pointedly meant the Soviet Union. In an earlier speech to the British House of Commons on June 8, 1982, although he did not use the exact phrase “evil empire,” Reagan had sounded similar anti-Soviet themes, outlining the evils of totalitarianism. All of this rhetoric was needed, in part, to justify the new nuclear defense hardware Reagan was proposing. But the “Star Wars” plan brought protests from Congress, Europe, and elsewhere, and was also charged with violating other international measures to prohibit the militarization of space. Still, the Reagan Administration charged ahead with money and planning as the U.S. Defense Department began to work on the new program. But Sting, in his song, wasn’t buying the idea of protection. “Russians” is a song that’s easy to mock, a very earnest song, but at the time it was written — at the height of the Reagan-Rambo paranoia years, when Russians were thought of as grey sub-human automatons only good enough to blow up — it seemed important. I was living in New York at the time, and a friend of mine had a gizmo that could pull the signal from the Russian satellite. We’d go drinking and then watch Russian morning shows in the middle of the night. It was apparent from watching these lovingly made kids shows that Russians weren’t quite the automatons that we’d been told they were. The song was also precipitated by my son asking me if there was a bomb that existed that could blow up the world, and I had to tell him, ‘Actually, yeah, there is.’ So he was introduced to that horror, the horror we’ve all lived with for most of our lives. It’s very cheeky to have stolen a bit of Prokofiev and stuck it in a pop song, but in that context it was right. (See more Sting comments on this song under “discography” at his website). In the mid-1980s, with the escalating nuclear rhetoric, the outlook did not seem bright. And Sting’s song found its listeners. Around the world, the song rose on the pop charts. In France, the song did especially well, peaking at No. 2 for three weeks and remaining in the top 50 for 19 weeks. In France the single also reached “gold” sales status, selling more than 500,000 copies. The single also hit No. 8 on the Dutch charts; No. 11 on the Irish charts; No. 16 on the Swedish charts; No. 13 on the Swiss charts; No. 12 on the U.K. singles chart; and No. 16 the U.S. Billboard Hot 100. In his music, Sting has not been reticent about raising political matters, or incorporating current events into his songs, which he would continue to do throughout his career. In fact, on The Dream of the Blue Turtles album, in addition to “Russians,” there are two other “social concerns” songs — “Children’s Crusade,” about heroin addition, and “We Work the Black Seam,” about the 1984 U.K. coal miners’ strike and nuclear power plants. Later publication of Jonathan Schell’s “The Fate of the Earth,” also incorporating later book, “The Abolition”. Click for book. 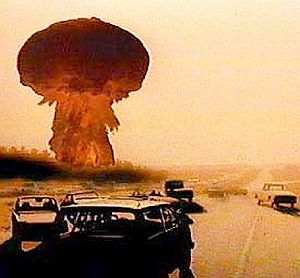 Scene from 1983 TV film, “The Day After,” here showing a nuclear detonation near Ft. Riley, Kansas. Click for DVD. Among the contributing reasons Sting’s “Russians” song found a receptive audience around the world was the fact that through the early and mid-1980s a U.S. and global activism had emerged around the idea of a “nuclear freeze” – meaning that the U.S. and Russia should then halt their nuclear build-ups, and move to de-nuclearize. A very powerful global, grassroots and political movement emerged around this idea – to stop the nuclear arms race. It was helped along by scientific and popular initiatives that gave it “political legs” throughout the 1980s, to the point where even Ronald Reagan would soften his aggressive position, admitting at one point that a nuclear war could not be won. Millions of people signed petitions and hundreds of thousands marched in street demonstrations in major cities. U.S. public opinion polls in 1982 and 1983 indicated an average of 72 percent supporting a Nuclear Freeze, with 20 percent in opposition. Contributing to the popular sentiment supporting the freeze movement were scientific theories and projections of a possible “nuclear winter” – a prolonged global climatic cooling hypothesized to occur following a nuclear war (caused by bombing-induced firestorms that would inject soot into the stratosphere, blocking sunlight, resulting in widespread crop failure and famine). 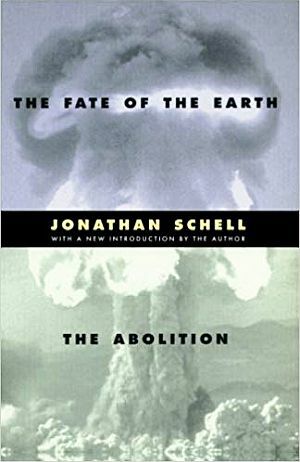 In early 1982, Jonathan Schell, a prominent journalist, wrote a series of essays for The New Yorker magazine that became a best-selling book, The Fate of the Earth, (March 1982) which cast nuclear war as global extinction event rather than a military-political battle between nation states. In the U.S. Senate, Ted Kennedy(D-MA) and Mark Hatfield (R-OR) introduced a Freeze resolution in March 1982, and in May 1982, the U.S. House of Representatives passed a Freeze resolution by a vote of 278 to 149. In November 1983, an ABC-TV film, The Day After – which followed the residents of a Midwestern city during and after a nuclear attack – also moved public opinion, as nearly 100 million Americans had watched the initial broadcast. 1984 book “The Cold and The Dark,” on nuclear winter, featured writing by Carl Sagan & others. Click for book. In 1984, the Nuclear Freeze was backed by all the major candidates for the Democratic presidential nomination and became part of the Democratic Party’s presidential campaign platform. Carl Sagan, a popular scientist, and his colleagues, published and promoted work on nuclear winter, which was adopted and advanced by activists to dispel the notion of surviving a nuclear war. 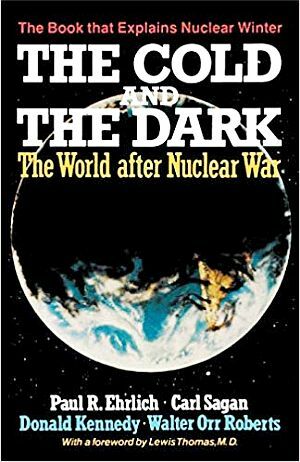 In 1984, The Cold and the Dark was published – the record of a 1983 Washington, D.C. conference of more than 200 scientists on the global climate and biological consequences of nuclear war, featuring two principal papers by Carl Sagan and Paul Ehrlich. With the re-election of Ronald Reagan in the fall of 1984, and declining media attention to the nuclear issue, the nuclear freeze movement lost some of its steam and reorganized into various anti-nuclear, disarmament, and peace efforts. However, the Nuclear Freeze campaign in the U.S. and abroad can take credit for generating pressure that moved Ronald Reagan and his administration to reverse their hard-line stand, even to the point where Reagan – to the surprise of his Secretary of State, George Shultz – began privately entertaining the idea of proposing to his Russian counterparts that they eliminate all nuclear weapons. In 1987, Ronald Reagan and Mikhail Gorbachev, in historic meetings, agreed to reduce nuclear arsenals as intermediate- and shorter-range nuclear missiles were later eliminated. In early November 1989, the Berlin Wall began to come down, and by December 31, 1991 the Soviet Union formally dissolved, ending the Cold War. The worry about nuclear weapons, however, did not dissipate, especially for those stockpiled in the Soviet Union during the Cold War that could now find their way to terrorists or rogue nations. “On the Amnesty Tour of 1986 the musicians were introduced to former political prisoners, victims of torture and imprisonment without trial, from all over the world. These meetings had a strong affect on all of us. It’s one thing to read about torture but to speak to a victim brings you a step closer to the reality that is so frighteningly pervasive. We were all deeply affected. Thousands of people have “disappeared” in Chile, victims of murder squads, security forces, the police, the army. Imprisonment without trial and torture are commonplace. The ‘Gueca’ is a traditional Chilean courting dance. The ‘Gueca Solo,’ or the dance alone, is performed publicly by the wives, daughters and mothers of the”disappeared.” Often, they dance with photographs of the loved ones pinned to their clothes. It is a symbolic gesture of protest end grief in a country where democracy doesn’t need to be ‘defended’ so much as exercised. (see more on this song, and more on Sting’s impressions of what he saw and experienced in Chile, under “discography” at Sting’s website). Sting and his wife, Trudie Styler, have used their celebrity on numerous occasions to help advance various social and environmental causes. Sting has also acted independently to advance his music when traditional avenues appear to block or slow its dissemination. Sting’s ‘Dream of the Blue Turtles’ album, 1985, which includes the song, ‘Russians’. “Khrushchev Tirade Again Irks Envoys,” New York Times, November 19, 1956, p.1. “We Will Bury You!,” Time, Monday, November 26, 1956. You Tube clip: Barry Goldwater’s Khruschev Clips, 1964 Election Ad. Jan Sejna, We Will Bury You, Sidgwick & Jackson, London, England, 1982. Book on communist Cold War strategies by former communist general Jan Sejna of the Czechoslovak Army, who later emigrated to the U.S.
Nikita Khrushchev, Khrushchev Remembers, Little Brown & Co., January 1970. “The United State Prepares for Nuclear War in the 1980s,” American Studies, Colorado.EDU. Sting’s ‘Fields of Gold’ album, a Best-of-Sting compilation, which includes ‘Russians’ and ‘They Dance Alone,’ among others. Kai Bird, American Prometheus: The Triumph and Tragedy of J. Robert Oppenheimer, New York: Alfred A. Knopf, 2005. Bernard Gwertzman, “Reagan Clarifies His Statement on Nuclear War,” New York Times Thursday, October 22, 1981, p. A-1. Hon. Ronald Reagan, President of the United States, “Address to the Nation on National Security,” March 23, 1983, reprinted in Congressional Record, U.S. Senate, March 29, 1996, p. S-3206. Lou Cannon, “Reagan Defends ‘Star Wars’ Proposal,” Washington Post, September 5, 1984, p. A-1. Cass Peterson, “U.S. Won’t Abandon ‘Star Wars’,” Washington Post, December 24, 1984, p. A-1. David Hoffman, “U.S. Firm In Pursuing ‘Star Wars’,” Washington Post, January 4, 1985, p. A-1. Don Oberdorfer, “Reagan Claims ‘Star Wars’ Progress Does Not Violate Terms of ABM Pact,” Washington Post, October 13, 1985, p. A-11. Sting Interview, Independent On Sunday (U.K.), November 1994. Amy Argetsinger and Roxanne Roberts, “The Reliable Source: Mrs. Sting, Happy to Play Her Part,” Washington Post, April 1, 2009, p. C-3.